Aquatint with etching of a large pagoda in Nadia by and after James Moffat (1775-1815) one of a set of views of Bengal along the Ganges and published Calcutta c.1804. James Moffat, a Scotsman, was based in Calcutta from the age of fourteen and is thought to have learnt his trade as an engraver in the city. Nadia, a district in West Bengal, is situated to the north of Calcutta. 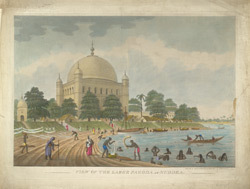 The building in this view is located at the bank of a river and consists of a dominating square structure crowned by a large dome. There are bathers in the foreground.